"First Families was the catalyst to begin learning about our family's roots. It's been fascinating. My son, John, and I have since traveled to old home sites and visited with relatives we never knew existed. We're more appreciative of our family's role in history." The triumphs and tragedies of past generations become real and heartfelt when you learn about an ancestor's life as an indentured servant, or feel the sorrow of a mother as her sons depart for America, or the loyalty that drove a soldier to wander a dark battlefield, lantern in hand, stepping over the dead and dying, to find his missing brother. Thousands have been inspired to begin their own fascinating journey into the past through the First Families of Tennessee. 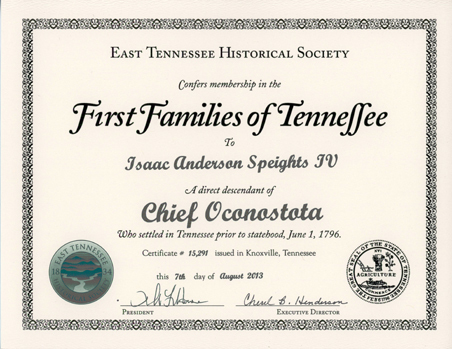 First Families of Tennessee (FFT) was established by the East Tennessee Historical Society (ETHS) in 1993 as a Tennessee Bicentennial project. Membership is open to anyone who can prove direct descent from a person or persons living in any part of what is now Tennessee before or by statehood in 1796. A handsomely designed certificate is issued by ETHS to applicants who qualify and are admitted to membership in FFT. The certificate features the state seal, along with the applicant's name and the name of the applicant's pioneer ancestor. Residence and each generation of descent must be proven by acceptable records. There is a one-time membership fee of $25.00 for each application. For more information, contact ETHS at 865-215-8824 or by e-mail. 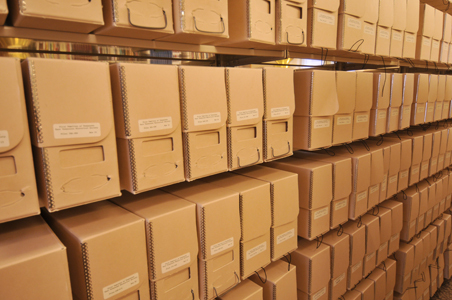 With more than 15,000 members, representing every state and eight foreign countries, the FFT applications and proof of lineage comprise the largest collection of information on the state's early settlers and their families. The FFT Collection is housed in the Calvin M. McClung Historical Collection at the East Tennessee History Center, where they provide a wealth of research materials for present and future historians and genealogists.